The 2011 Ulysses S. Grant Presidential $1 Coin will be the second of four strikes released by the US Mint in 2011 as part of its Presidential $1 Coin Program. Coins in the program honor the former Presidents of the United States with this specific strike honoring the eighteenth President, Ulysses. S. Grant. He rose to prominence during the American Civil War and eventually assumed the top Army post of General of the Army of the United States. He remained in charge of the Army during the initial years following the end of the war and became a strong opponent of then President Andrew Johnson. With the backing of the Republican Party, Grant won the Presidency in 1869 and served for two terms. Unfortunately, his administration was plagued with scandals and he left the office unpopular to many. 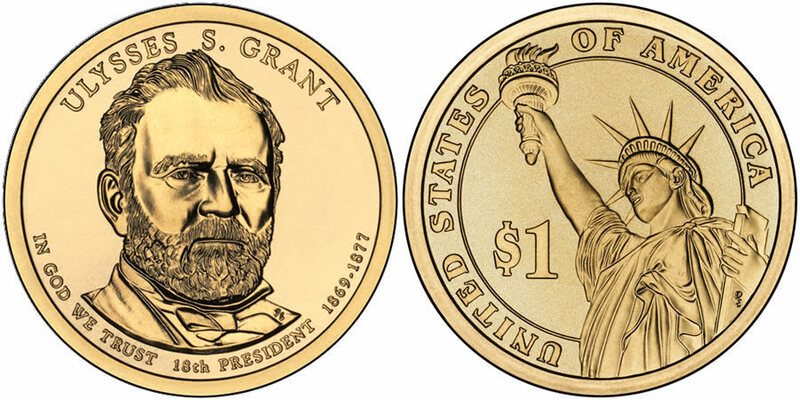 United States Mint Sculptor / Engraver Don Everhart designed the portrait of Ulysses S. Grant that is seen on the obverse of the coin. Surrounding his image are the inscriptions of "ULYSSES S. GRANT," "18TH PRESIDENT," "1869-1877" and "IN GOD WE TRUST." Don Everhart also designed the reverse showing the Statue of Liberty that is included on all of the Presidential $1 Coins. Around the statue are the inscriptions of "UNITED STATES OF AMERICA" and "$1."